1.22 ct Diamond and 15 ct Yellow Gold Bangle - Antique Victorian. Hallmarked 18ct Gold London. Very Good Condition. If you have a Google account just enter M G Welch Jewellers for the link. Carat weight.70cts. Find this beautiful bangle here at Miltons Diamonds. Material: 14ct. Diamond Cut: BAGUETTE AND BRILLIANT. Diamond Colour: J/K. Diamond Clarity: VS1/2. Total Diamond Weight: 1.99CT. 1.16 ct Diamond and 14 ct Yellow Gold Bangle - Antique Russian Circa 1910. 2.85ct Diamond and 18ct Yellow Gold Bangle - Vintage Circa 1980. The bangle features a fine, 3mm, twisted cable design adorned with 3 diamond stations. The diamonds add a very elegant and fancy touch to the design totaling exactly 0.28 carats in weight. This bangle does not have a clasp which makes it easy and very comfortable to wear. The bangle features a fine, 2.7mm, braided cable design adorned with 3 diamond stations. The diamonds add a very elegant and fancy touch to the design totaling exactly 0.15 carats in weight. This bangle is very easy and comfortable to wear and further it is secured with a sturdy lobster claw clasp. 1.62 ct Diamond and Enamel, 14 ct Yellow Gold 'Crown' Bangle - Antique Circa 1930. 2.25 ct Diamond and 14 ct Yellow Gold Bangle - Antique Russian Circa 1935. .35ct natural diamonds bangle bracelet. Style Bangle. Beautiful Flush Mount / Bezel Tube Set. Clasp Type Bangle Bracelet. Diamond Shape Round. Main Stone Shape Round. Rounds & Full cut. Main Stone Creation Natural. 2.28ct natural diamonds bangle bracelet. Style Bangle. beautiful sharing / common prong. Total Carat Weight (TCW) 2.28. Diamond Color G. Rounds & Full cut. Cut Very Good. Both sides of the bracelet are nicely flattened throughout which allows for comfortable fit and stacking next to other bangles for a modern look. A truly elegant piece loaded with glamorous stones. Type:Hinged Bangle. Large Elephant Fine Diamonds 38.00ct. Used Bangle Y. & W.18k. Gold Mint Cond. Large Elephant Fine Diamonds Bangle 18k. Yellow and White Gold. 250 diamonds on elephant heads. 200 diamonds on bangle. Elephant each head – 17 mm x 14.50 mm x 25 mm. 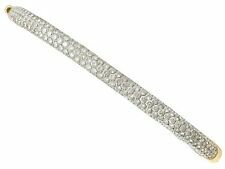 Excellent Quality Diamonds Bangle very well finish. Hearts On Fire 18K Yellow Gold Diamond Bangle Bracelet. Bracelet stamped "HEARTS ON FIRE CO.". 18K yellow gold bracelet weighs 30.8g. Bracelet is 7.25" long. Bracelet is large size. Style Solitaire. When ordering from the US, parcels may be subject to import tax and duty charges, which the buyer is responsible to pay. THIS IS A GUARANTEED BARGAIN DEAL OR MONEY BACK!!!! TWO TONE STRIPPED CHAMPAGNE AND WHITE DIAMOND BANGLE BRACELET Unique jewlery piece, absolutely an eye catcher! Here's an amazing bracelet bangle that holds 4.10 carats of round natural diamonds in FANCY COLOR and WHITE theme Champagne diamonds: VS-1 clarity White diamonds: G-color VS-2 clarity MICRO PAVE SETTING 100% FABULOUS, WHITE AND SHINNY CLEAN DIAMONDS It measures 7 inches / 65mm circumference From the center it measures 7mm wide This will perfectly fit a SMALL - LARGE wrist "light and fancy" Hand made setting, set under microscope Mounted and Hallmarked 14kt solid white gold that weighs 17. 14K Solid Yellow & White Gold Deco Style Hinged Open Bangle Bracelet with Pave Diamonds. The bracelet is hinged so it can be easily worn with a traditional push clasp with safety latch to protect it from loss. Here's a contemporary slim diamond bangle in 14kt rose gold setting 2.4mm slim bangle braclet that hold all natural round brilliant diamonds in shared prong setting 3.23 carats of G-color VS-2 clarity diamonds WHITE, SHINNY, CLEAN STONES! It measures 7.5 inches / 68mm circumference This will perfectly fit a SMALL - MEDIUM wrist NOTE: THIS HAS NO OPENING, IT IS A ETERNITY BANGLE TYPE "light and fancy" Setting made by hand, and diamonds set under a microscope by hand Mounted and Hallmarked 14kt solid rose gold that weighs 10 grams Comes with box ESTIMATED RETAIL PRICE: $3,200 SKU: 15848 Buy with confidence from a bonafide jeweler! We strive to offer competitive prices so you can be confident with your purchase. The round brilliant cut diamonds are individually prong set into the white gold, marquise shaped settings which boost more shine to the unbelievable sparkles and brilliance these diamonds display. It is in like new condition, and 100% ready to wear. ITEM SPECIFICATIONS Description All Natural Diamond and Emerald Bangle Handmade to perfection, excellent quality, top grade materials!Eye Clean, No Enhancement, Natural Diamond, Natural Emerald!Grab this chance on owning an expensive item offered at a wholesale price! Item Details SKU 32199 Total Carat Weight 1.05 (0.60 Diamond, 0.45 Emerald) Certification Will Certify Upon Request Cut Grade Very Good Metal 14k Yellow Gold Metal Weight 8.2 grams Size Fits up to 7.25 inches Wrist Ring Dimension 2.5 x 65 millimeters Condition Brand New with Tags Estimated Retail Price $2,372.00 Buy it Now!!! $949.00 Center Stone Type Diamond Shape Round Cut Very Good Color F Clarity VS2 Side Stones Type Emerald Shape Round Cut Very Good Clarity VS2. This stunning, hinged bangle bracelet is crafted in solid 14k yellow gold and neatly bezel set with 5 round brilliant cut diamonds across its top. A like new, truly elegant bracelet with fascinating diamond stones. Interlocking Stackables. Secure Wire bend interlocking under mount design. Natural Fancy color diamonds Bangle bracelet. Bangle top diamond area: 6.2mm. Style Bangle. Fancy Yellow Brown. Fancy Pink Brown. David Yurman 18k Yellow Gold & Silver Diamond Bracelet. Color stones are cheap in wholesale, and it is easy to reproduce. Bracelet is 7mm wide. 18k & silver bracelet weighs 47.2g. Style Bangle. Bracelet stamped "D.Y. 750 925". The bracelet has been tempered so it has a spring like action when opened so it is easily worn or removed. The bracelet is cross banded in three stations across the top side with each being pave set with round brilliant diamonds. .24ct natural diamonds bangle bracelet. Style Bangle. Clasp Type Bangle Bracelet. Bead: 4 mm wide. Main Stone Creation Natural. Total Carat Weight (TCW). 24. Total Carat Weight. 24. Diamond Shape Round. This magnificent antique bracelet was crafted from solid 14k yellow gold during the early Victorian era. (1) Natural Genuine Citrine - Oval Cabochon Cut - Prong Set - Rich Orange-Yellow Color - 0.40ct (approx.). NEW Italian 14K Yellow & White Gold 0.28ctw Round Diamond 6.5" Stackable Twisted Cable Bangle Bracelet. The bangle features a fine, 3mm, twisted cable design adorned with 3 diamond stations mounted in solid white gold settings. NEW Italian 14K Rose & White Gold 0.28ctw Round Diamond 6.5" Stackable Twisted Cable Bangle Bracelet. The bangle features a fine, 3mm, twisted cable design adorned with 3 diamond stations mounted in solid white gold settings. THIS IS A GUARANTEED BARGAIN DEAL OR MONEY BACK!!!! ROUD BRILLIANTS CLUSTER FLOWER DIAMOND BANGLE BRACELET Unique jewlery piece, absolutely an eye catcher! Here's an amazing bracelet bangle that holds 2.25 carats of round brilliants diamonds in a classic cluster theme F-G color VS-2 clarity clarity 100% EYE CLEAN, FULL OF BRILLIANCE AND SHINE It measures 7 inches / 62mm circumference From the center it measures 10mm wide This will perfectly fit a SMALL - LARGE wrist "light and fancy" Hand made setting, set under microscope Mounted and Hallmarked 14kt solid white gold that weighs 16. .96ct natural diamonds bangle bracelet. The Stackable Eternity's. Style Bangle. Rounds & Full cut brilliants. Cut Excellent. Total Carat Weight (TCW). 96. Natural Round, brilliant Diamonds bangle bracelet. Style Bangle. Diamonds bead set set by hand. Main Stone Creation Natural. Exact Carat Total Weight 14.02. Country of Manufacture United States. Country/Region of Manufacture United States. WOMEN'S SOHO OF ITALY 18K WHITE GOLD, PAVE DIAMOND & BLACK ENAMEL BRACELET 7"
The bracelet is signed and stamped by Soho and marked as 18k Gold. Pave Diamonds: Appx 1.2 CTS. Style Bangle. Clasp Type Bangle Bracelet. - Center round diamond (.20ct). Diamond Color F. Main Stone Shape Round. Secondary Stone Diamond. - 12 side round diamonds (.60ctw). Natural diamonds bangle bracelet. Mod Elegant. Style Bangle. safety clasp/ snap lock. Bead set, smooth & clean finish. Round, Full cuts. Cut Very Good. Diamond Color H.
14k SOLID YELLOW GOLD 1CTS VS2 NATURAL DIAMOND ARTISAN HANDMADE BANGLE BRACELET. The details are very nice. Gemstone: Natural Diamond : 1 cts ,VS2. Style Bangle. Clarity VS2. STAMPED 14K. ARTISAN ZEST FINE JEWELRY. Very Impressive 1.35 Carats Natural VS Diamond 14K Solid White Gold Bangle Bracelet. STAMPED: 14K. Total Carat Weight (TCW) 1.35. This estate bracelet is in perfect condition and looks like new. Bracelet total weight: 10.6g. ESTATE 14K YELLOW GOLD BRACELET. CHANNEL HINGED BANGLE DESIGN. DIAMONDS ARE H/I COLOR VSSI CLARITY. 48 CARATS. RUBIES ARE 1.00 CARATS. 2.2MM WIDE. BRACELET FITS LARGE WRISTS. SIDE SAFETY. WRITTEN APPRAISAL SERVICE AVAILABLE. David Yurman Double X Cable Diamond Bracelet. Color stones are cheap in wholesale, and it is easy to reproduce. 14K yellow white gold bracelet weighs 32g. Bracelet stamped "D.Yurman 14k". Diamond G color VS2 clarity. MODERN 18K ROSE GOLD BANGLE BRACELET. PAVE HINGED STACKING DESIGN. DIAMONDS ARE F/G COLOR, VSSI CLARITY. 77 CARATS. WRITTEN APPRASIAL SERVICE AVAILABLE. AVAILABLE IN WHITE & YELLOW GOLD. Style Bangle. Reflect Panther Endless. Cheek to Cheek on Panther Head: 17.4mm. Natural diamonds Bangle Bracelet. Style Bangle. Clasp Type Bangle Bracelet. Total Carat Weight (TCW) 6.40. Total Carat Weight 6.30ct Natural Vivid Red Ruby on Eyes. These stones rise above the center of the bracelet embraced by sturdy, open 4-prong settings which allow each diamond to show its magnificent sparkle from every angle along the sides of the bracelet. Signature:Charriol 750. Here we have a 100% authentic Charriol cuff bangle bracelet crafted from multiple twisted black stainless steel cables accented with 18k white gold diamond and pearl stations. Stone(s):(19) Natural Genuine Diamonds - Round Brilliant Cut - Burnish Set - VS1/VS2 Clarity - G/H Color. Here we have a classically styled yet uniquely designed hinged bangle bracelet crafted in solid 14k yellow gold. ESTATE 14K WHITE GOLD BRACELET. PAVE & BEZEL SET 3 STONE STACKING DESIGN. DIAMONDS ARE G/H COLOR VSSI CLARITY, 2.21 CARATS. WRITTEN APPRAISAL SERVICE AVAILABLE. Jewels By Sam | Fine Modern & Estate Jewelry. When ordering from the US, parcels may be subject to import tax and duty charges, which the buyer is responsible to pay. THIS IS A GUARANTEED BARGAIN DEAL OR MONEY BACK!!!! TWO TONE BLACK AND WHITE DIAMOND BANGLE BRACELET Unique jewlery piece, absolutely an eye catcher! Here's an amazing bracelet bangle that holds 3.52 carats of round natural diamonds in BLACK and WHITE theme Black diamonds: VS-1 clarity White diamonds: G-color VS-1 clarity MICRO PAVE SETTING 100% FABULOUS, WHITE AND SHINNY CLEAN DIAMONDS It measures 7.5 inches / 65mm circumference From the center it measures 9.2mm wide This will perfectly fit a SMALL - LARGE wrist "light and fancy" Hand made setting, set under microscope Mounted and Hallmarked 14kt solid white gold that weighs 25. **Item Details** Model Number: SDL-EW90007DW3, Metal: 18k White Gold, Weight: 35.65 grams, L x W x H: 40 x 60 x MM, Style: Bangles **Diamond Details** Total Carat Weight: 2.57 CT, Diamond Count: 255, Shape: Round, Color/Clarity: F / VS2, Other Shape: Round, Other Color/Clarity: F / VS2, Certificate: GGA. Edwardian Era Design. 1.60ct natural diamonds bangle bracelet. Style Bangle. Clasp Type Bangle Bracelet. Total Carat Weight (TCW) 1.60. Total Carat Weight 1.60. Main Stone Creation Natural. Country/Region of Manufacture United States.